Clark has joined the Real Food movement, which is designed to nourish everyone — including producers, consumers, communities, and the earth. Our water filling stations save water and cut down on waste. 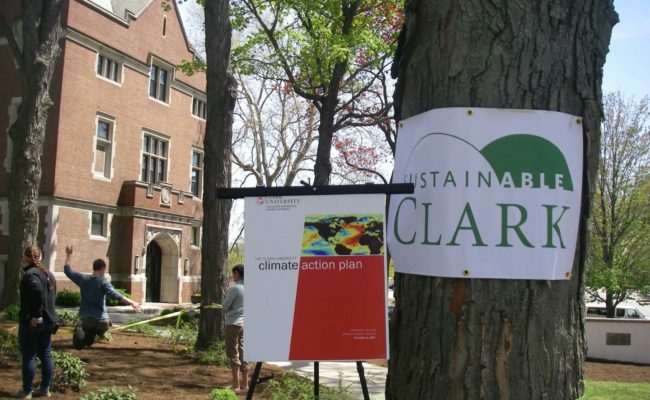 These initiatives are just two of the reasons Clark has won national and regional EPA awards. Clark signed the Real Food Challenge in 2013, committing Clark Dining to serve 20% ‘real’ food as measured by expenses by 2020; we are now at 14%. 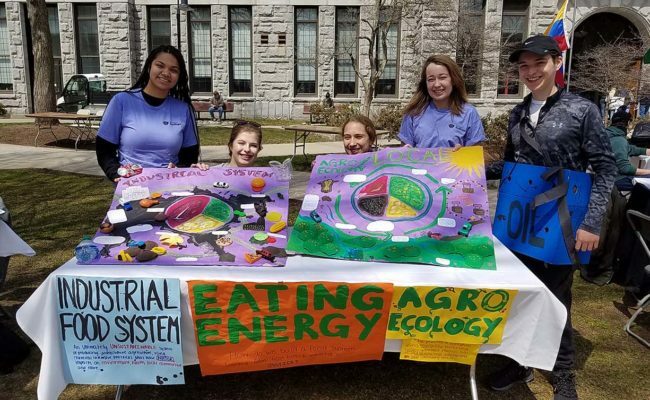 The commitment was the result of many years effort by a strong group of students, Food Truth and the interdisciplinary Food Systems Working Group. Academic classes and student teams continue to investigate possible ‘product shifts’ that will responsibly and fiscally move us toward the ultimate goal. Beginning in 2012, ‘Hydration Stations’ to refill your reusable water bottle with chilled, filtered water were added on two floors of Goddard Library, in Johnson-Sanford Center, in Wright, Bullock, Dodd and Maywood Halls; in Jefferson Academic Center, the University Center and 4 other academic buildings. The ones in the residence halls were purchased by the Student Sustainability Fund! 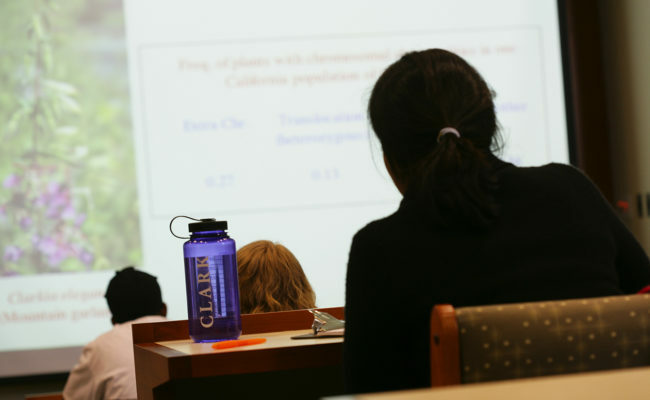 In 2012 Clark installed the first hydration stations in Kneller Athletic Center, University Center, and Jonas Clark academic building. The water bottle filling stations filter and chill municipal water, and are integrated into existing water fountains. The filling spout is motion-activated and dispenses 12 ounces of filtered, chilled water into refillable water bottles, eliminating the need to purchase wasteful and costly single-serving plastic water bottles. An automatic counter on the units shows how many disposable water bottles have been diverted from landfill by using the filling stations. The Environmental Protection Agency has awarded Clark a coveted National Achievement Award in 2013’s Food Recovery Challenge, one of only 9 such awards across the entire US! The Food Recovery Challenge measures efforts to reduce and manage food waste from dining and other functions. 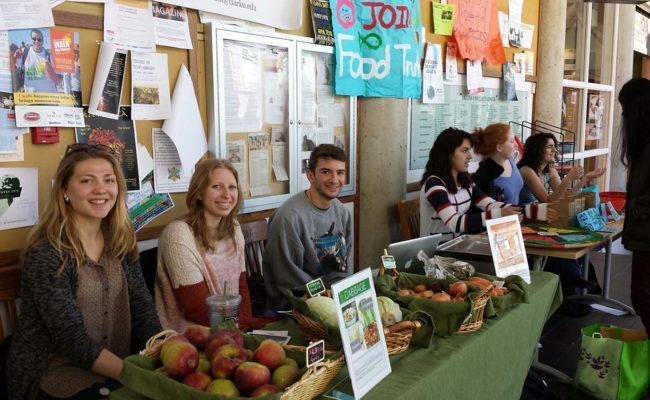 Clark composts all food waste from the Higgins Cafeteria, but also composts soiled paper waste from the University Center, the Recycling Center, and other locations. 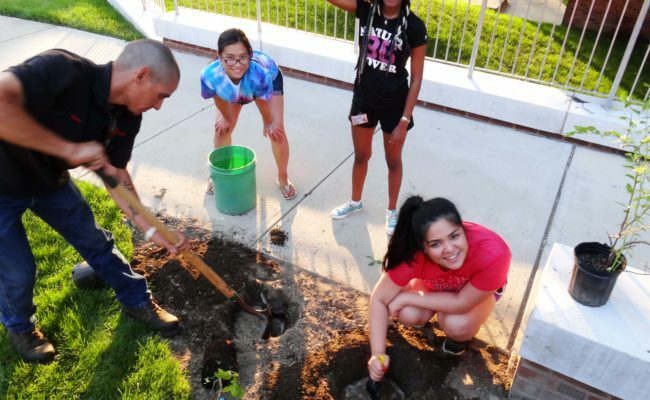 Dorm composting began in fall of 2013 with the student-led Clark Composts! program. We compost over 200 tons per year! If it was ever alive — you can compost it! 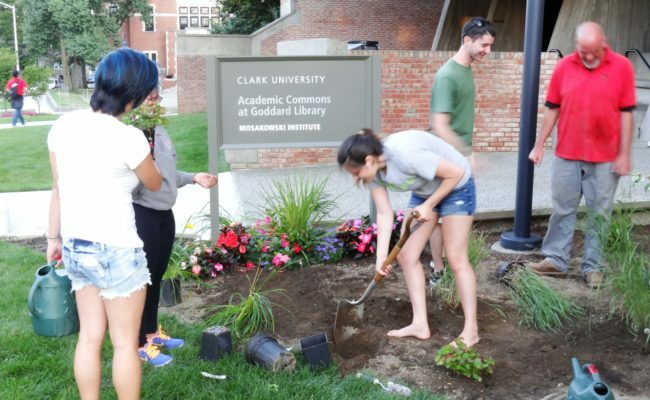 Clark’s first (and Worcester’s third) rain garden was installed in April 2012 by a group of students who had researched the pollution-filtering technology in their Sustainable University class the previous semester. Will Maxwell, Samantha Sandella, Kerry Burke and Samantha Boyle (all ’15) collaborated with graduate student Ya’ara Persing (IDCE CDP ’12), the Clark Sustainability Collaborative, Clark Grounds Department and the Blackstone River Coalition to design, fund and install the rain garden in front of Admissions where it will capture and biofilter stormwater runoff from the roof. Native species in the garden will attract wildlife. A primary goal of the project is to provide an educational demonstration to encourage homeowners to help reduce pollution in local waterways. 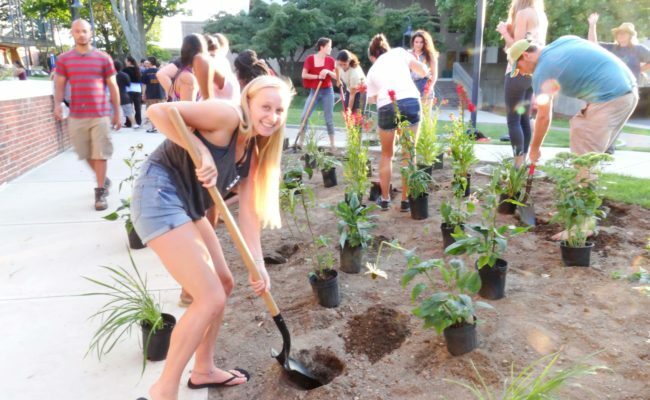 In the summer of 2014, a persevering student team that began their research in Fall 2013’s class The Sustainable University collaborated with Clark Grounds Dept., the Herban Gardeners, and RLH to install three new biodiversity “edible landscaping” gardens outside the AC, Wright and Dodd Halls. 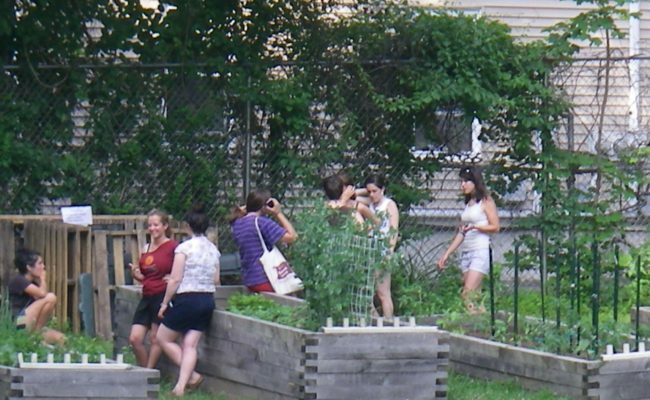 The gardens are full of native species that provide food and shelter for birds, insects and other wildlife — replacing monoculture grass and bringing an oasis of color and biodiversity to the urban landscape! 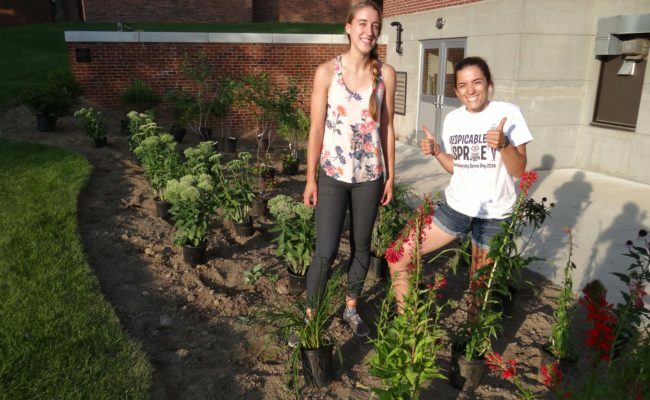 Erin Wirtemburg ’15 and Samantha Dokus ’15 received funding from the SSF for their project, and the plants now in those gardens served double-duty during Commencement 2014 by decorating the stage. Thanks to an SSF grant Thanks to an SSF grant won by Melissa Miller ’16 and collaboration from Grounds Dept., Clark has moved into the 2000’s with irrigation technology: we have a new Rainbird control and monitoring system that, among other features, allows staff to remotely manage irrigation, automatically shuts off if there is a water main problem, uses flow meters to precisely monitor water overuse, and can be expanded to run off a weather-based model. Right now, we only have the Rainbird system installed on about half of the irrigation zones – maybe someone will apply for a second SSF grant! This summer Grounds also installed new rain sensors and replaced faulty ones to work with the Rainbird system and address irrigation zones across campus. The rooftop-mounted sensors override automatically programmed irrigation in the case of sufficient precipitation. Water savings from these two overhauls is conservatively expected to be 15-20%, more as we expand the system. Water efficient shower heads and toilets were installed across campus in 2011 and 2014. The upgrades will help Clark reduce water consumption by an estimated 4 million gallons a year — that’s equal to a line of tanker trucks over 2 miles long! Dual flush, low tank volume and other appropriate toilet technology is in use; check the handle or the button on the toilet and make the wise flush to save water. The new shower heads provide the same shower experience while reducing flow from 2.5 gallons per minute to 1.75 GPM. 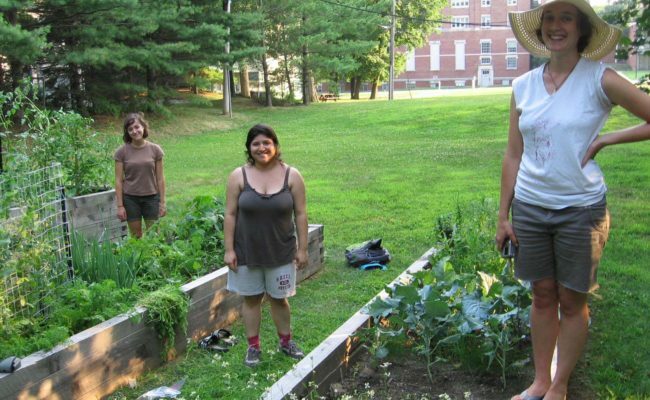 Worcester boasts several farmer’s markets, but they can be hard to get to on an academic schedule. 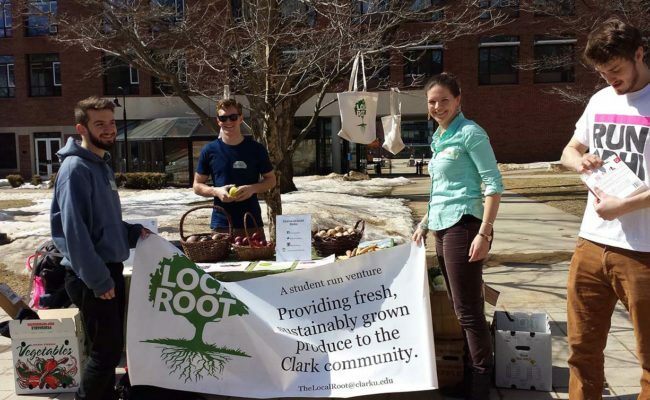 A student run venture, The Local Root, solves that problem for students, faculty and staff who want access to fresh and local foods. The Local Root re-sells locally and sustainably grown produce at weekly farmer’s market-style tables on the Green and via a subscription and on-campus delivery service. For more information, email The Local Root.